Less is not more. It's less. Unless it's more. Now 13 months into the"simple life" we have realized we are not one iota less busy but we are certainly happier, joyful even. Maybe not as over the moon happy in mud as our (then) 8-year-old grandaughter Allana, but we're close. It's amazing how having so much less has made us so much happier. In the last year we have given up many big things, a 3000 square foot farm house, certified organic dairy, beef and pork farm, with a large customer base, our small retail store, tractors, big mowers, grinders, spreaders and 90% of our livestock. We went from managing 40 acres to barely 7. On the smaller scale we have said goodbye to our microwave, our clothes dryer, 75% of our furniture, our bathtub, 50% of our clothing, disposable items like napkins, paper towels, baggies, glad wrap and aluminum foil (no worries, we still have toilet paper, we're not complete barbarians). We also traded a tremendous amount of business related stress for extra time to do frivolous things, like sleep. Our days are just as long, up very early and working outside till very late but the projects are homesteader-driven, instead of customer or regulatory agency driven. 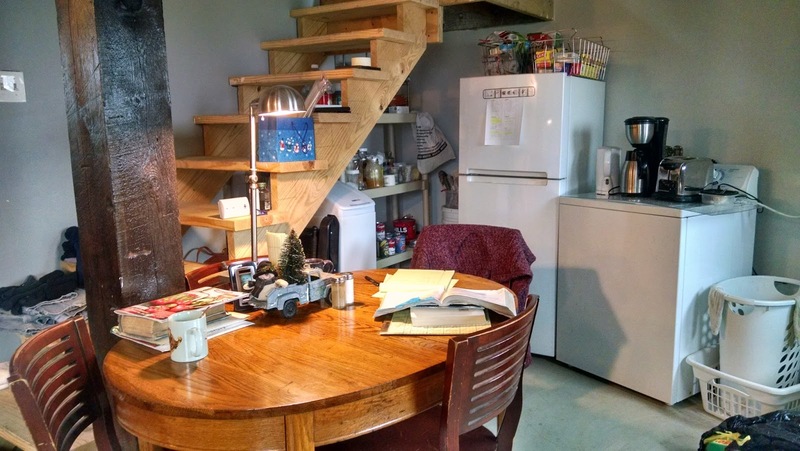 I used to spend many hours each week keeping paperwork up to date for our organic certification, entering sales receipts, paying state and federal taxes on our store, making and receiving phone calls to customers, chefs, processors...while Keith did the majority of all the outside work. I was also in school full time so our work load was endless and mind-boggling and we had only ourselves to blame. Now, the only deadlines we have to meet are self-generated. 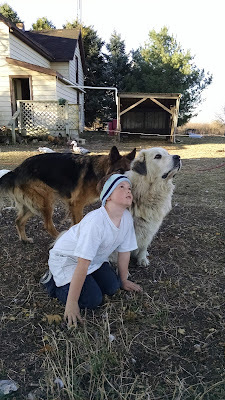 We'd like to finish our bigger chicken coop this summer, and complete my kitchen pantry. We hope to build a small milk house and we must can or freeze a million pounds or so of produce we've planted so there is not money for willy-nilly grocery shopping anymore. We plan to make all our cheeses soon and soap making is back on the agenda. We need better shelter for our 6 steers and milk cow Holly before winter and it sure would be grand if we could get the windows and doors in our grain bin house trimmed. BUT, it's up to us how hard we work on each project each day. We have less money, fewer possessions and less responsibility. If we choose to stop, and watch a couple of crazy squirrels play in a tree, we can. A couple of years ago WE were the rodents running in circles. What the %! @# is a "Food Plot"? Back in the prehistoric 1960's my parents moved us out of Chicago and into the wilds of Warrenville Illinois. For the first time in their married lives and after having five children, they were done with apartment living. I suspect their landlords may have been done with them as well. They bought a two story, four bedroom bungalow with a basement and detached garage for a whopping $16,000. The yard, now get this, was covered in grass!!! We thought we had died and been reborn on the TV show Green Acres. Our neighbor even had a garden, the kind where things grew in the dirt. We were enthralled. I was so enthralled that when my best girlfriend decided we should "borrow" some of those veggies, load them in my red wagon and peddle them about town, I hesitated not. We sold tomatoes and cukes, green beans and well, that was it, because about two hours into our scam of the century my father caught us. He made us give all the cash we had collected, to the neighbor who owned the garden after we admitted our wrongdoing and begged his forgiveness, of course. We also had to weed this mans garden every Saturday for the rest of our lives. At least it seemed that long; I think we did it for two weekends until dad forgot or the neighbor died or something. I can't recall. What did I learn? To steal from someone across town, and peddle your hocked goods in the next state where your father is not a member in good standing of the very small, very volunteer police department, that's what I learned. And yes, I also learned that gardening is hard work and it stinks for one person to put in the sweat equity while another gleans the profits. Which brings me to the latest New Age Nonsense, the renaming of gardens as "food plots", as if carrots had the brains to scheme. Vegetables have no time to devise plans, to seek revenge, to develop pyramid scams, they are too busy just putting down roots. The space in a yard where you dig up the sod, loosen the dirt and plant seeds is called a GARDEN. We have three garden spots (just because that rhymes with food plot, does not negate my argument) and we are working like dirty, sweaty dogs to convince plants to grow in them. All winter Keith piled up our cow manure so that it would be ready for garden spreading this spring. Our soil here on The Poor Farm is heavy with clay, drains poorly and needs as much organic material as we can dump on it. And dump we did. 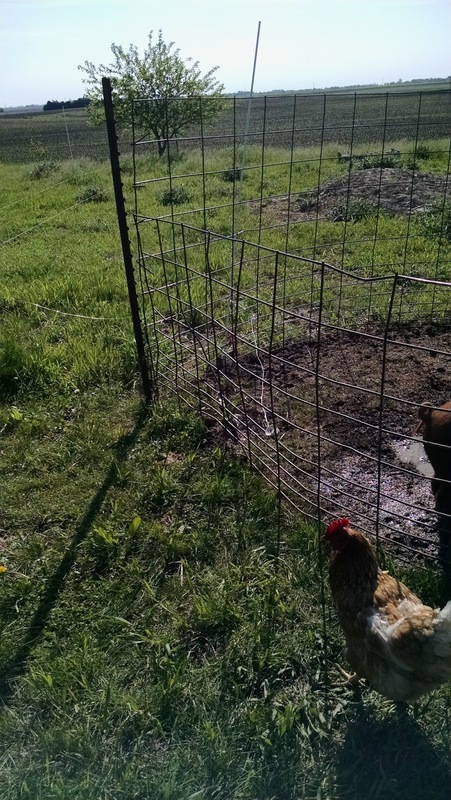 Manure mixed with straw and old hay went on top of our designated GARDENS, Seeds and seedlings were planted and then we mulched with newspaper, cardboard, grass clippings, and more straw or rotted hay. It is slowly making a difference. As our GARDENS grow I'll post more pictures but in the meantime...neighbor children be warned. If I catch any of you steeling veggies from me for your own high falutin' get-rich-quick schemes you'll be weeding my GARDEN for at least three Saturdays, maybe four. I will also give you a high-five for your entrepreneur spirit and send you home with enough zucchini to choke an elephant. Just typing that blog title makes me feel like Elmer Fudd, because having Red Wattle hogs under our care again makes me wary wary happy. These amazing heritage hogs were once on the endangered list meaning there were less than 2000 of them world wide. Ten years ago Keith and I were awarded the Frontera Farmer Foundation Grant (sponsored by chef Rick Bayless). for our "Save the Red Wattle Project." 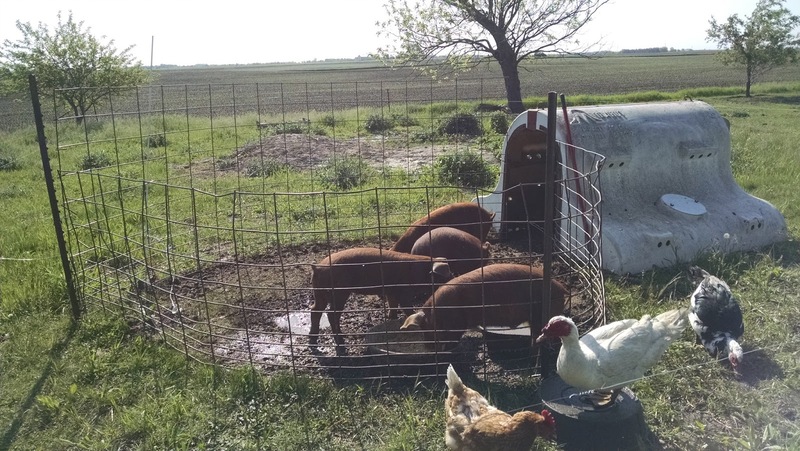 This generous grant allowed us to purchase Red Wattle breeding stock, build housing for them, and obtain a livestock trailer for hog pickup and deliveries. 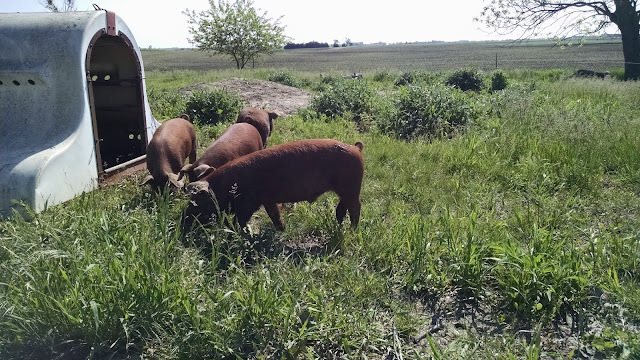 Our hog population thrived, we sold processed pork to restaurants and grocery stores and we taught other farmers how to raise these cool porkers. Over that decade the breed popularity grew as chefs, small farmers and customers acquired a taste for this outstanding meat. 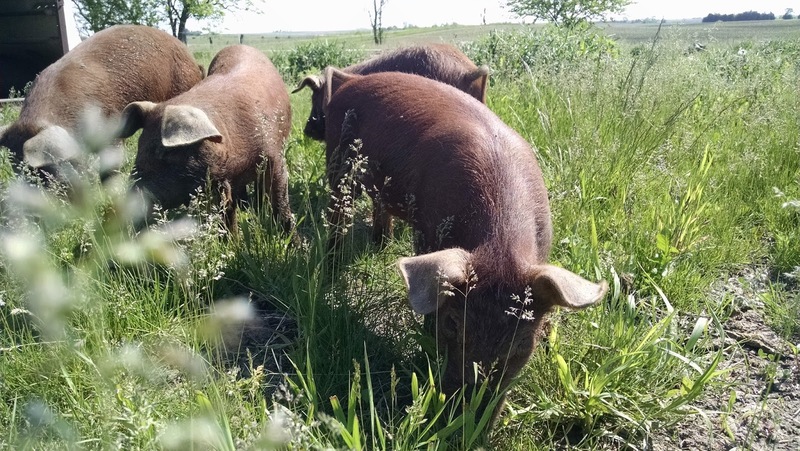 Two years ago the The Livestock Conservancy decreased the hogs status from "Critically Endangered" to "Threatened" which is a movement in the right direction. When we sold our big farm last year, we also sold our Red Wattle breeding stock and so, like many other small farmers that were once dependent on us for feeder pigs, we had to purchase our piglets from another breeder, one we had sold stock to about five years ago. Thanks so much Jim Hart, your piglets are fabulous! It's a small small porcine world. 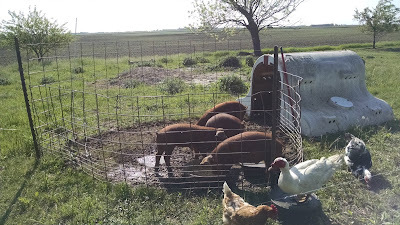 When the pork chop quad arrived on The Poor Farm, we built them a small enclosure made of, what else? hog panels, and ran a hot wire across the end of their pen. It did not take then long to figure out that getting shocked is no fun. Just ask me. I'd rather be trapped for an hour on a elevator alone with Hilary Clinton than be shocked. No, wait, I'd rather be shocked. Never mind. After their voltage avoidance probation period was complete (about one week) we moved them into their big, grassy, sunny pasture for the summer. Pigs, contrary to what many confinement hog farmers will tell you, do love to eat grass. They also love to tear up weedy sod, eat worms, grub and ants and the occasional disoriented duckling. 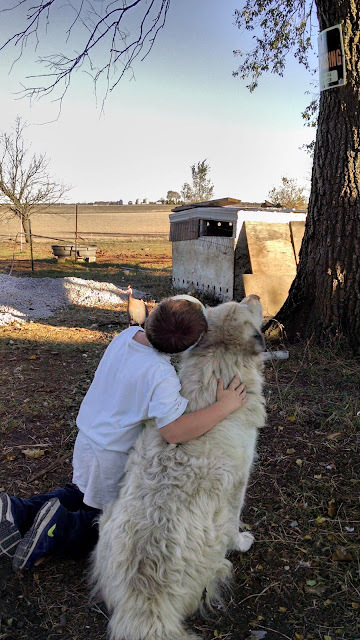 Ah yes, the romantic side of real homesteading does involve a bit of sacrifice. All summer these fellows will feast on greens, organic grain, and milk from our cow. 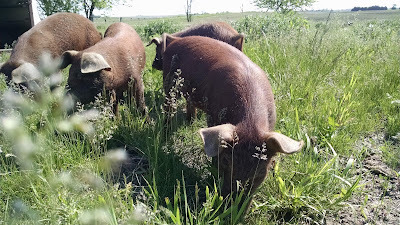 They will destroy thistle plants, and improve our poor soil by loosening it with their wide snouts and enriching it with their manure, They will run and jump and play hide and seek. (They always find me, I think I need to lay flat in the weeds) They will be happy and healthy as they are allowed to act like pigs, not just commodities with legs trapped inside climate-controlled-concrete -floored prisons. In the end, their locker date is in October, they will be fat and scrumptious and right up until their last moments, they will experience a good life. Hello. My name is Donna and I'm a carnivore. Wow. That was quite the blog sabbatical. Four months of negligence, but my excuses are stellar. As you can see by the photo above, I was consumed with my part time modeling job. I was also finishing my last semester at the University of Illinois. It only took forty years to wrap up what I started there in 1976. 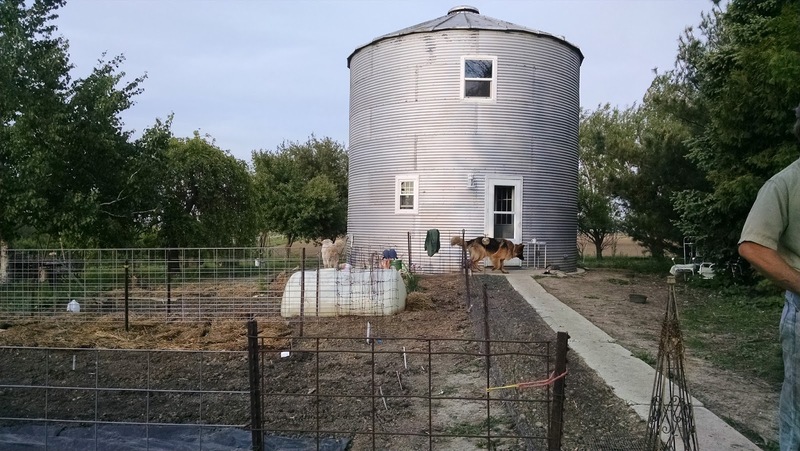 Our grain bin house continues to evolve, new pictures coming very soon, and the past few weeks have been spent putting in vegetable and fruit gardens. Keith did most of that hard work as I was swamped with the ever important Italian verb conjugations, American Literature Post 1914 essay deadlines, Western Civilization exams and Shakespeare production analysis papers. But now, I am three days post graduation, and have reclaimed my previous manure-prenure position. Just before walking down that blue and orange aisle, I allowed my nursing license to go "inactive." Not as easy a task as I thought it might be. Over thirty years in healthcare flashed before my droopy lidded eyes as I stared at that question on the State of Illinois License Registration Renewal Page. Active? Inactive? Active? Inactive? I finally decided that if I was going to take my new career seriously, I needed to say goodbye to the old one. It also cost $40 to renew my license and nothing to let it lapse. Decision made. 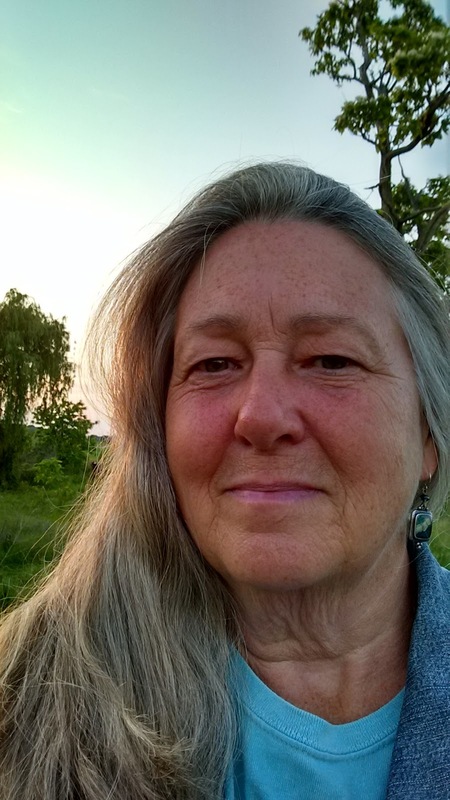 In the spirit of all these new beginnings I have removed my old photo from this blogs home page. Like my nursing license, I was sad to see her go. 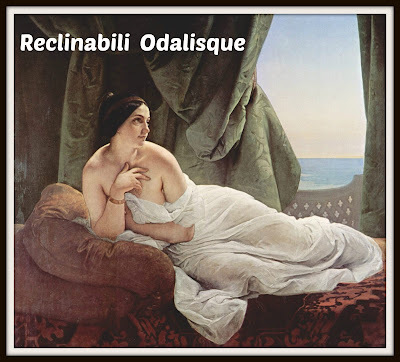 She was younger, thinner, brunette-ier (yes, brunette-ier, my major was creative writing not English) and replaced her with the current me who is older, wider and greyer. Today I turn 57 and I'm looking forward to all the future holds. So, bite me, AARP, and please remove my name from your mailing list, retirement is a dirty word here on The Poor Farm.